Chicken Paprika Recipe . Authentic Hungarian Recipe. The Hungarian chicken paprika recipe is a creamy yummy stew slowly cooked with onions, green peppers and seasoned with paprika and sour cream. Once you try it, it becomes your favorite Hungarian dish. The authentic chicken paprika recipe states that chicken has to be cooked with lard, and actually it tastes much better like that, but for health reasons you obviously can replace the lard by any type of oil. I personally use olive oil and it tastes as delicious. Chicken paprika is a lovely sample of the traditional Hungarian cuisine and it is originally accompanied by galuska (nokedli or csipetke). A kind of home made dumplings that Hungarians use frequently as garnish for stews and in soups. Galuska is easy to make and in fact it is very tasty. 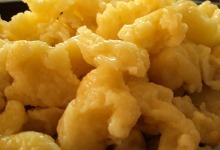 However, if you don’t have the time to make your own galuska, you can use pasta such as fussili or pipe. Clean and cut the chicken as preferred. Stir-fry the onion in oil until almost transparent, add the tomato and saute. Remove the pot from heat, sprinkle with paprika and stir well (it will prevent paprika form burning, otherwise it will give a bitter taste to the stew). Bring the pot back to heat, add the chicken and the green pepper. Season with salt and ground pepper. Mix well. Add enough water just to cover the chicken. Cover , bring to boil, reduce heat and cook over low heat for about 40 minutes or until the chicken is tender. When chicken is done, mix the flour in half cup of sour cream until smooth, then add a small amount of liquid from pot into flour mixture and stir with whisk until smooth. Add the mixture to the chicken stirring constantly. Simmer for about 5 minutes and add the remaining sour cream. Make sure that the sauce gets creamy but not too thick. 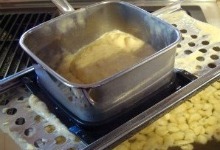 Stir in flour, oil and just enough water, mix well with a spoon to make a soft dough. Boil a generous amount of salted water in a large pot. When the water starts boiling, using a dumpling strainer, pass the dough through a Dumpling Maker letting the pieces fall into the boiling water. If you don’t have a dumpling maker, a cheese grater plate works perfectly as well. Alternatively, you can use a cutting board and a knife to extend the dough and cut it into small pieces above the coiling water, so you add the pieces straight away to the hot water. Simmer until the galuska comes to the surface. Drain the galuska into a colander placed into your kitchen sink. Lift the colander and shake off excess water. Quickly rinse it in cold water (it prevents galuska from sticking)and place it into a bowl. Add a piece of butter and let it melt. Stir and keep warm. 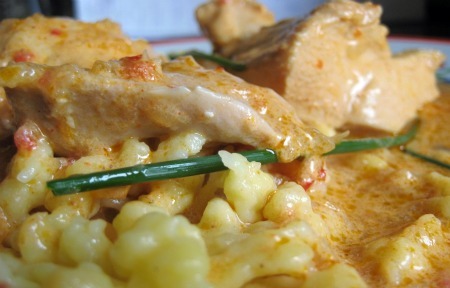 Chicken Paprika or Paprikas Csirke (in Hungarian) is one of the most popular and representative dishes of the Hungarian cuisine. It is considered a Hungaricum (a term often used to refer anything typically Hungarian), because it has everything the Hungarian cuisine is characterized by: paprika, pepper, onion, garlic, green pepper, tomato, sour cream, meat. Bákonyi Modra Paprikás Csirke . Chicken Paprika with mushrooms. Rakott Paprikás Csirke. Baked Chicken Paprika. Ínyenc Paprikas Csirke. Gourmet Chicken Paprika with marjoram and crushed garlic. Have fun trying this mouthwatering traditional Hungarian dish!